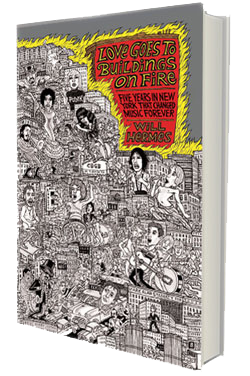 Love Goes to Buildings On Fire: Five Years in New York City That Changed Music Forever (Faber & Faber/Farrar, Straus and Giroux) is about the creative explosions in NYC’s music scenes---punk, hip hop, disco, salsa, jazz, classical---during some of the City’s most troubled years. It begins at the Mercer Arts Center on January 1, 1973, and ends at the Lower Manhattan Ocean Club on December 31, 1977. It’s an inspirational story about a city that’s changed a lot in thirty-plus years, but in some ways hasn’t changed at all. << Dramatis personæ: Patti Smith, DJ Kool Herc, Lou Reed, Bruce Springsteen, Miles Davis, Talking Heads, Richard Hell, Willie Colón, Bob Dylan, Laurie Anderson, The Ramones, Arthur Russell, The New York Dolls, Grandmaster Flash, Nicky Siano, Rubén Blades, Rashied Ali, Television, Jonathan Richman and the Modern Lovers, David Murray, Blondie, Lester Bowie, David Bowie and many, many more. Click to see the cover illustration, drawn by the incredible Mark Alan Stamaty. "Can literature change your life? Yes ... along came Will Hermes, who cost me several hundred pounds on iTunes and ruptured my relationship with guitars." 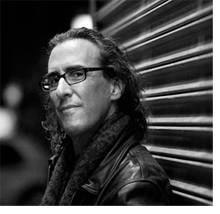 Will Hermes is a senior critic for Rolling Stone and a longtime contributor to NPR’s “All Things Considered.” His work turns up periodically in The New York Times; he has also written for Spin, Slate, Salon, The Believer, the Village Voice, City Pages, The Windy City Times, and other publications. He co-edited SPIN: 20 Years of Alternative Music (Crown/Three Rivers, 2006) with Sia Michel, and his work has appeared in the Da Capo Best Music Writing series.